English ivy is a vigorous perennial vine or groundcover. It is hardy to zone 5 and evergreen. The leaves can be green or variegated. It is grown mainly as a ground cover to control erosion or as a climber, but dwarf varieties are also popular houseplants and outdoor container plants. All parts of English ivy are poisonous, so keep plants away from children and pets. Some people are allergic to the sap; wearing gloves while pruning it is recommended. English ivy spreads aggressively when grown on the ground. It is considered a noxious weed in some states. Check with your county extension agent or local nursery before planting ivy in the garden. Ivy is easy to grow in fertile soil that is watered regularly when first planted. Once established, it becomes somewhat drought tolerant. Applying mulch around the base of the plant helps maintain good moisture levels in plants growing on the ground. If grown in containers, water on a regular schedule. English ivy can grow in full sun, but in hot weather the leaves might become scorched. A part shade position is best to protect it from midday sun during hot summers. Fertilizing is seldom needed. An application of slow release fertilizing granules in the spring is sufficient to keep ivy healthy. Overfertilizing can actually cause problems, making ivy more likely to get diseases. Pruning might be necessary every few years on vining types of ivy. To encourage bushier growth on container grown plants, pinch the stem tips. 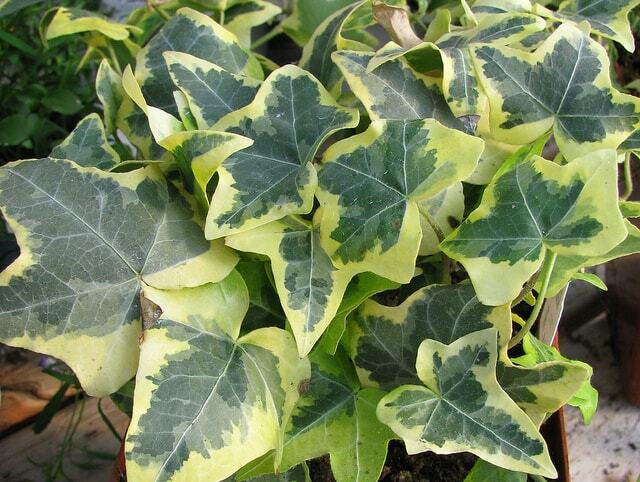 Ivy is available in nurseries as starter plants in spring. It is easy to propagate by stem cuttings about six inches long. Remove all the leaves from the bottom half and place cuttings either in water or dip in rooting hormone and place in a mixture of potting soil and sand or perlite. They should root in about four to six weeks. Hedera helix 'Gold Dust' - small green leaves, marbled with creamy white. Good variety for containers.